Last week I described a bygone day of two-way loyalty between companies and their employees. While I doubt that day will ever return, I proposed a few ways in which managers can give their people a healthy, realistic sense of community and security. Maybe you’re not a manager or a leader. You’re a rank-and-file worker, and you’re not in a position to try out any of those things I talked about. Today we’ll look at it from your point of view. What can you, as a worker, do to increase your sense of community and security when there seems to be too little of both? Here are a few ideas. Leave a comment and tell me what you think. Happy ending to the video: the switches are installed in a rack. Last month I made my first live-action video (as opposed to screen shots). The video shows how to install network switches in a rack. It won’t win an Academy Award, but it’s taught me a lot about writing scripts, planning video and photo shoots, recording audio, and editing the whole package. I know those new skills will serve me well on other projects. Try doing new things whenever you can. You’ll increase your value to your employer, and you’ll add new skills to your repertoire. The idea is not to make yourself indispensable (as if you could). The idea is to make yourself flexible so that you’re ready to take on new roles or, if need be, to land a new job. I know. You’re introverted. So am I. You won’t see me in the middle of the action at the next company party. But I’ll be there, and I won’t be hiding behind the potted fern either. I hope you’ll be there too, because you can’t feel like you belong to a community if you don’t act like you belong to the community. Wallflowers are pretty. But they don’t reflect — or inspire — loyalty. When I mentioned loyalty, remember that I described it as two-way loyalty. You want to know that your company’s loyal to you, while you’re being loyal to your company. Loyalty to the company doesn’t just mean following the rules, showing up on time, and always speaking well of Good Old Spacely Sprockets. It also means — it especially means — being loyal to the people who make up the company, the people who work alongside you, the people who might want to feel like they’re part of a community too. So say hello to them. Chat with them at the water cooler. And for heaven’s sake, don’t pass up the company party. Maybe, even though things look the same, your workplace has changed. Your car’s in the same parking space. Your cubicle walls are the same shade of — what color is that? But you know things are different. There was such a great vibe when you hired on, but today — for whatever reason — all the joy is gone. Maybe the management team changed. Maybe a merger or an acquisition upended the culture. Maybe the company’s slipping in the marketplace and everybody’s stressed out about it. It’s normal to feel uneasy, even helpless, in the face of changes like these. Yet it’s vital to keep your balance. How? Make sure your center of gravity is secure. Take stock of yourself. Remember what’s really important to you. Decide what you are, and are not, willing to do. I once joined a company I admired for the high quality of its work and for its generosity of spirit. Over time, through a series of setbacks and managerial changes, I saw those good attributes fade away. Eventually I saw that I was part of a company that cut corners and tried to squeeze as much money as it could from customers and employees. How long would it be before I was called on to do something that went against my values? Before I was asked to betray a client’s trust by passing off poor-quality work? I had to decide what mattered to me: which lines I could cross and which ones I couldn’t, even if it meant losing my job. Fortunately, I never had to make such a drastic choice. But by drawing those lines, by determining that I wouldn’t cross them, I empowered myself. I gained a bit of control over my situation — and with it, a sense of security. I knew that, even if things around me went sideways, I could stand firm and hold onto my integrity. I also kept my resume up to date and constantly checked job postings, which gave me an additional sense of control — hence, again, a sense of security. I kept in close touch with my professional network, so that they became my community. Eventually it paid off: I found a new job in a much better situation. This work — this taking stock and drawing boundary lines — is something you have to do for yourself. You can’t delegate it. You can’t get it from reading a book or a blog post. It’s uniquely yours. Don’t neglect it, even if right now you’re happy with your situation. Things change. Make sure you’re ready. This entry was posted in Leadership, Professionalism and tagged community, ethics, flexible, introversion, learning, security, self-inventory, skills on August 2, 2017 by Larry Kunz. A quiet revolution — I’m in. Are you? Shh. I’m taking part in a revolution. It’s Susan Cain’s Quiet Revolution. It’s about empowering introverts — who make up between one-third and one-half of the population¹ — to be their best selves. This entry was posted in Leadership and tagged introversion, introvert, Quiet Revolution, Susan Cain on April 1, 2014 by Larry Kunz. Recently I’ve been reading books written by, and about, the great world leaders of the last century. 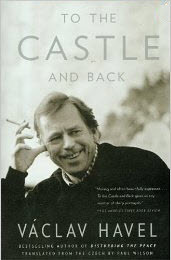 This entry was posted in Leadership and tagged convictions, introspection, introversion, introverts, leadership, Vaclav Havel on September 13, 2013 by Larry Kunz.